About 23 hours after saying good-bye to 26 players, Raiders coach Hue Jackson got around to talking about the moves, which included bringing back eight of those 26 on the practice squad. Nothing earth-shattering from Jackson on the roster moves. He did have some interesting things to say about his current players. For one, Jackson said he is set with Jared Veldheer, Stefen Wisniewski, Samson Satele, Cooper Carlisle and Khalif Barnes as his starting offensive line. “From the start of training camp, I saw a unit of men start to battle, start to take coaching and continue to get better,” Jackson said. He said things might have been different were it not for early injuries to Bruce Campbell and Stephon Heyer. In the end, those guys just had too much making up to do. Wisniewski was anointed the starting center when the Raiders selected him in the second round of the NFL draft in late April. The re-signing of Satele in late July compelled the Raiders to find another spot for Wisniewski. Jackson also said that “absolutely” he expects veteran wide receiver Chaz Schilens to play against the Denver Broncos in the regular-season opener Sept. 12. Defensive tackle Richard Seymour and cornerback Chris Johnson joined Schilens at practice with the rest of their teammates. The only regulars still sidelined with injuries are receiver Louis Murphy, safety Mike Mitchell and tight end Kevin Boss. *Saturday was a tense day for many of the Raiders who weren’t assured of roster spots. One of the surprise players who made the team is cornerback Joe Porter. He stayed up until 5 a.m. after the return flight from Seattle, uncertain of his future. He said he didn’t find out he had made the team until he showed up to the facility Sunday morning before practice. So it was that Porter beat out 2010 draftees Walter McFadden and Jeremy Ware, as well as promising undrafted rookie Sterling Moore. Family and friends started calling Porter after the cuts were announced Saturday night, but he still wasn’t sure what to make of things. *No sooner had linebacker Ricky Brown been cut by the New England Patriots did the Raiders move in. 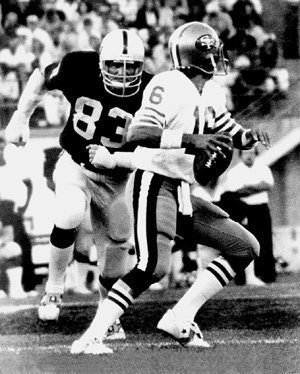 Brown spent his first five NFL seasons with the Raiders. He signed with the Patriots this offseason after he failed to receive a contract offer from the Raiders. Brown surfaced on their radar again once Travis Goethel suffered a season-ending knee injury and Sam Williams was waived. Brown said the Raiders were the only team he wanted to hear from. Jackson said it was nice seeing a familiar face. Brown said he isn’t sure how he will be used, other than on special teams. He is scheduled to meet with linebackers coach Greg Biekert to find out what the Raiders expect of him moving forward. *Strong safety Tyvon Branch received high praise for the pass he intercepted against the Seattle Seahawks on Friday night. Hearing praise for his pass coverage skills for a change is nice, he said. As for the criticism, Branch was asked if it’s warranted. *Raiders rookie quarterback reportedly will appeal his five-game suspension. Jackson said that’s of little concern to him right now as he prepares his team for the regular-season opener. Pryor passed through the locker room, but he grabbed a bag and walked back out before he could be approached for comment on word that he intends to appeal the suspension. *Jackson said he is content entering the season with Jason Campbell and Kyle Boller as his quarterbacks. The Raiders waived Trent Edwards on Saturday. So, what happens if Campbell and Boller get hurt in the same game? For the record, Lechler played quarterback in high school, and he routinely throws passes during practice. He throws a better pass than most quarterbacks, truth be told. *The Raiders kept four tight ends on their roster. That owes more to the quality of the players, Jackson said, and isn’t an indication that Boss won’t be able to play against the Broncos, if not longer. Boss suffered a knee injury against the 49ers on Aug. 20. He said his sprained medial collateral ligament is getting better and that there’s a good chance he will be able to play against the Broncos. *Some teams scour the waiver wire after roster cutdowns and target players from other teams when forming their practice squad. The Raiders felt most comfortable signing their own players. *Backup safety Mike Mitchell spoke Sunday for the first time since he suffered a knee injury in practice almost a month ago. He said he is making progress, running around and gearing up for the Broncos. Mitchell’s injury was severe enough to cause him to need crutches to get around at one point during camp. He said he intends to make sure that he is all the way healed so that his injury doesn’t linger or become aggravated and cause him to miss an extended period of time. BigTed, you are going to put an * by the names of the guys who had to change the pick due to cuts, or injuries right? Yup, “*” means your first pick ain’t playin’. Condo is not eligible for the MUP. Have a Great Labor Day Raider Nation! No, those guys would have been good selections last year. an Stephen wiz on the MUP list? The Blog idiots: Terrapin, Brown hole priest, and Lefty wholeheartedly believe DHB is on the cusp of being something great. Anyone that these quixotic cretins believe is going to be great is probably not a legit NFL player. Sadly, if DHB takes major snaps then than then I hope you bet on the Raider win total going well under 6.5. Al kills the team by not only reaching in the draft, but he compounds the problem by refusing to move on from selecting a player that will never live up to Al’s perception. Just watch DHB will get major snaps and DVD will play enough to kill these teams chances to improve..
the key has always been Raider defenders leaving their gaps, to make a big play, and cut back runners like Arian Foster getting big chunks of yardage. They didnt quite shore up the linebacking, but the defensive line rotation is just good enough. Bresnahan’s coverages were always played better than they actually were b/c we had Woodson, and he had Leon Hall and Pro Bowler Johnathan Joseph.